Retina display! 8-megapixel camera! Video calls! HDMI port! The last few days have seen lots of shouting from proponents of the hot phones of the minute, the Apple iPhone 4 and the Motorola Droid X. Which phone really delivers the best experience? We got our hands on both and tested them in seven categories: cost of ownership, storage, connection speeds, still and video image capture, display and resolution, operating system, and multitasking and media playback. The iPhone 4 won the majority of our battles--but barely. Both phones are incredibly fast, have superb displays, and come loaded with multimedia features. 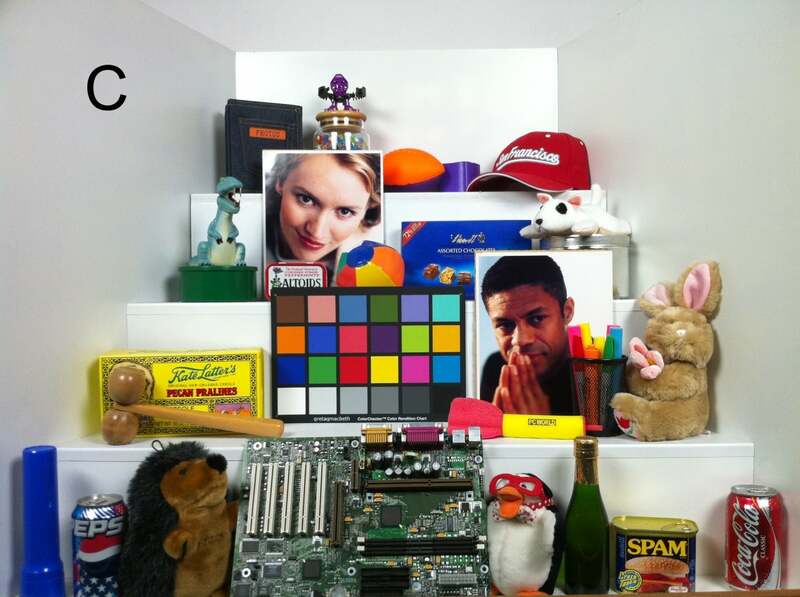 Some of our tests, such as OS and media playback, come down to personal preference. On the other hand, our display, still camera, and camcorder tests clearly prove that the iPhone 4 is stronger in those categories. And the iPhone 4 won our data-speed and voice-quality tests, though they were confined to San Francisco; the results could be different in other parts of the country. Soon, we'll be putting the HTC EVO 4G and the Samsung Galaxy S through the same testing, so check back for those results. At this point, you've probably become pretty familiar with the iPhone 4 (available now on AT&T; $299 for 32GB, $199 for 16GB, both with a two-year contract) and the Motorola Droid X (available July 15 for $200 on Verizon, also with a two-year contract), but here's a quick refresher. The Droid X's standout features include a 4.3-inch display, an 8-megapixel camera, HDMI and DLNS connectivity, and a 1GHz TI OMAP processor. The iPhone 4's headlining features include its "Retina display," an improved 5-megapixel camera and a front-facing video camera for video calls, and HD (720p) video capture. To see how the specs stack up against each other, take a look at our comparison chart (click to enlarge). The Stats: In the connectivity department, the Droid X and the iPhone 4 both come with Wi-Fi, GPS, and Bluetooth. What the Droid X can do and the iPhone 4 can't is to act as a mobile hotspot. For an extra $20 per month, the Droid X allows you to connect up to five compatible Wi-Fi devices, such as your laptop, your iPad, or other gadgets, to Verizon's network. Both phones boast noise-cancellation technology, which is supposed to improve call quality by blocking sounds around you, leaving only your voice. Testing Methodology: We tested the iPhone 4 and the Droid X in five San Francisco locations and used the same testing methodology we use for our 3G speed tests. We used the FCC-endorsed Ookla testing app on both the iPhone 4 and the Droid X to measure upload speeds and download speeds. The Ookla test sends a stream of packets from the phone to a network server and back, and then measures the average speeds at which the packets make the round trip. We ran three consecutive speed tests on each phone at each location and then picked the best upload and download speeds of the three. 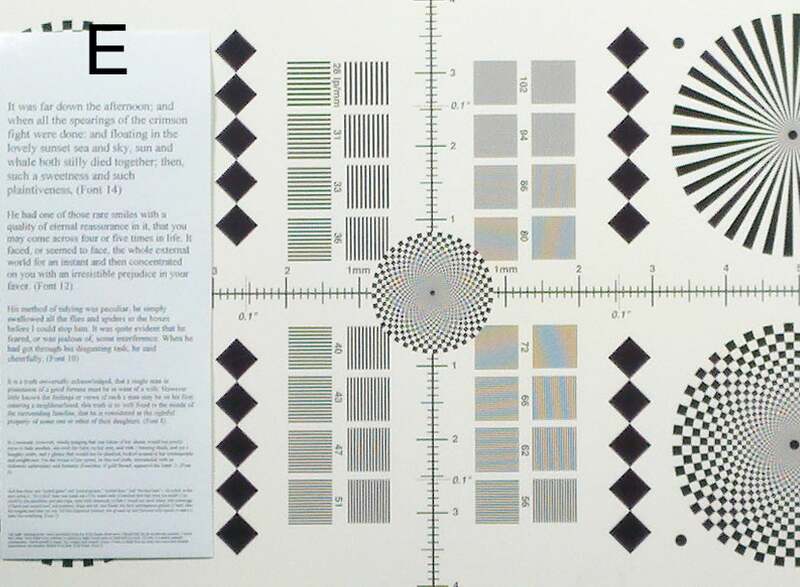 Our voice-call tests were more subjective; we placed calls to a common local number, listening for static, jitter, delay, dropped calls, or a failure to connect, and then assigned a score to each call. In our informal performance testing in San Francisco, the AT&T-connected iPhone 4 registered far faster download speeds than the Verizon-connected Droid X did. The iPhone 4 showed an average download speed of 1958 kbps (almost 2 mbps) across our five testing locations in the city. The Droid X had an average download speed of 1130 kbps--still more than enough speed for reasonably fast Web browsing and standard-definition video watching. The two new devices posted similar average upload speeds; the iPhone4 registered 434 kbps and the Droid X averaged 564 kbps. Those upload speeds are fast enough to support basic file sharing but not enough to make fat-pipe apps such as multiplayer gaming or videoconferencing run well. 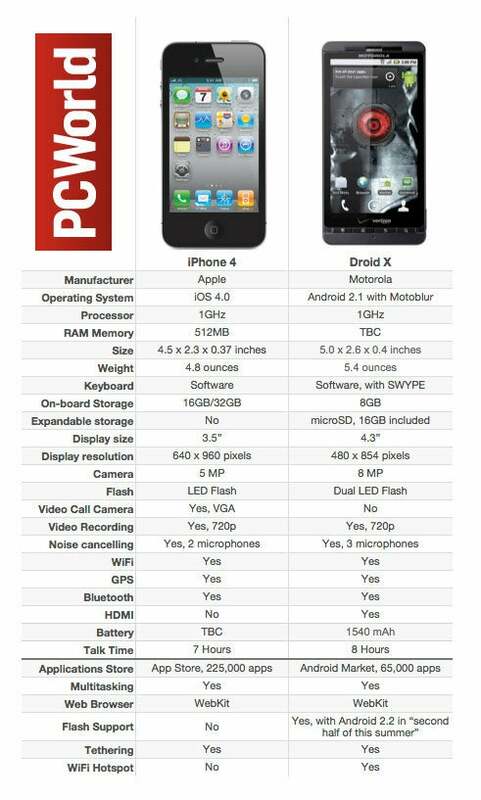 The iPhone 4 showed an even greater advantage over the Droid X in our voice-call quality tests. In almost all the test calls we placed around the city, calls on the iPhone 4 sounded better than the Droid X. Calls sounded more natural, and were more pleasing to listen to on the other end of the line. We recorded no dropped calls on AT&T. In test calls using the Droid X, the audio coming out of the earphone was usually clear enough, but it didn't sound as full and pleasing as that coming out of the iPhone 4. On the other end, I'm told, my voice sounded loud enough, but not as dynamic and even a bit shrill. We also noted some minor static on some calls, as well as a warbling sound in other calls. We recorded only one dropped call using the Droid X. Obviously, you can't generalize too much from these tests. We were able to test in only one city, and testing over wireless networks is inherently unpredictable--weather and network traffic can affect the results in unknown ways. 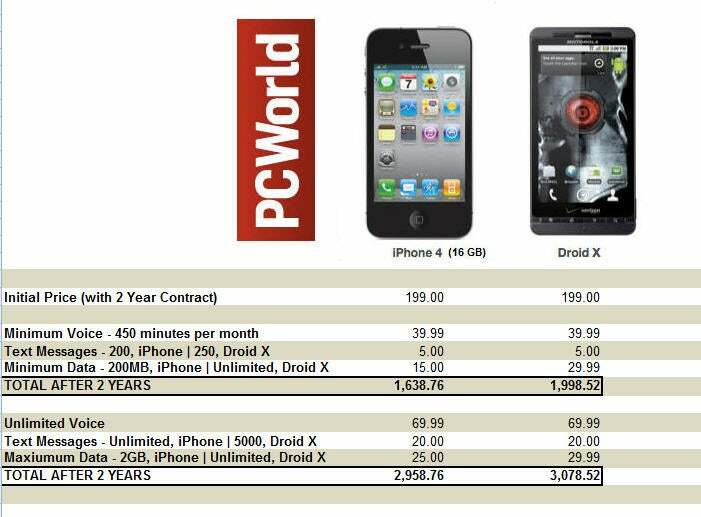 Our conclusion: With the cheapest options, Droid X costs about $360 more over two years than the 16GB iPhone 4 does, but the Droid X plan includes unlimited data, compared with 200MB for the iPhone 4. With the high-end plan options for both smartphones, the Droid X costs $120 more over two years. The Droid X plan includes unlimited data, while the iPhone 4's data is capped at 2GB per month (though, to be fair, few users will exceed the 2GB limit). You should also consider how much storage you're getting for your money. The iPhone 4 comes in only 16GB and 32GB models, as the previous 3GS generation did. As we all know too well, the iPhone 4 does not have expandable storage. The Droid X, on the other hand, has 8GB of storage built in, and comes with a 16GB MicroSD card in the box. And because the Droid X supports MicroSD cards up to 32GB, you can extend its storage up to 40GB. The total cost of ownership is not significantly more, and you get a larger data allowance and the potential for more storage capacity. The Specs: The iPhone 4 sports a 5-megapixel camera sensor with an LED flash, which is a nice upgrade from the iPhone 3GS's 3-megapixel camera with no flash. The camera supports tap-to-focus in shooting mode, as well as photo geotagging. 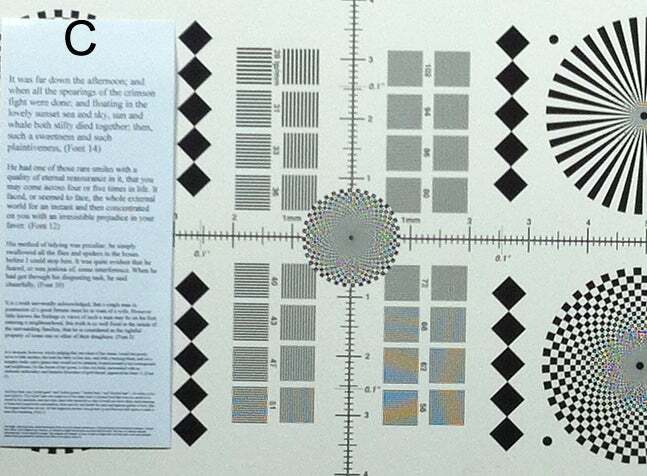 On paper, the Droid X's camera seems a bit stronger. It has an 8-megapixel display with a dual-LED flash. The Droid X offers no tap-to-focus, but it does have a face-detection feature that will automatically focus on a (human) subject. In addition to an Auto mode, the Droid X has a handful of basic scene modes that you can adjust based on the shooting environment: Landscape, Portrait, Macro, Sports, Steady Shot, Sunset, and Night Portrait. Here are the still-life shots from the iPhone 4 (left) and Droid X (click to enlarge). Still-life shot by the iPhone 4. Still-life shot by the Droid X. Below are the text and target charts, again with the iPhone 4 on the left (click to enlarge). Test shot from the iPhone 4. Test shot from the Droid X. 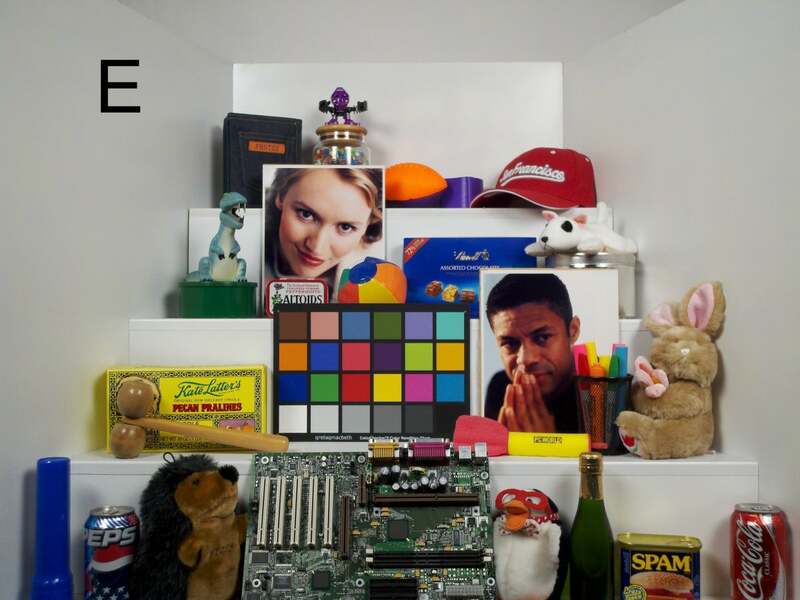 Here's evidence that megapixel counts rarely matter: Apple's 5-megapixel iPhone 4 beat out the Droid X for overall image quality in our tests, serving up well-exposed, brightly colored images in our lab tests. However, the iPhone 4's image quality did lag behind the competition in two categories: sharpness and visible distortion. The 8-megapixel Droid X scored closely behind the iPhone 4 in all tests, however, and even beat the iPhone 4 in our sharpness tests.